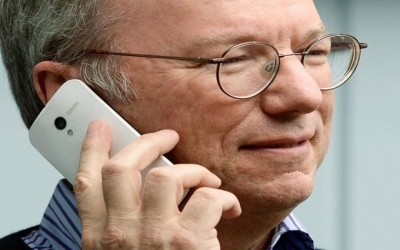 Google's Eric Schmidt wants to help you jump from Apple to Android. iPhone users who plan to ask Santa for an Android phone can follow "Erics Guide" to ease the transition. Ringing in the holidays the Google way, Executive Chairman Eric Schmidt took to Google+ on Sunday to tell us all that " many of my iPhone friends are converting to Android." Why? "The latest high-end phones from Samsung (Galaxy S4), Motorola (Verizon Droid Ultra) and the Nexus 5 (for AT&T, Sprint, T-Mobile) have better screens, are faster, and have a much more intuitive interface," Schmidt said. "They are a great Christmas present to an iPhone user!" Alcatel OneTouch Fierce, Evolve hop over to MetroPCS Click! Google rebuilds Android camera base for better photos Can Intel turn Android into Windows? To help all those jumping ship from the iPhone, Schmidt released a how-to guide. His step-by-step tutorial tells you how to set up your Android phone, transfer items from your iPhone or iPad, and upload your iTunes music to the cloud. His final piece of advice: "Be sure to use Chrome, not Safari; its safer and better in so many ways. And its free." Many of the comments to the post appreciated Schmidts free but not exactly unbiased tips and tricks. Of course, transferring your content is only half the battle. iPhone users accustomed to iOS must then learn the ins and outs of life on an Android device. Only one question: how soon before Apple responds with its own guide designed to help Android users jump ship to the iPhone?